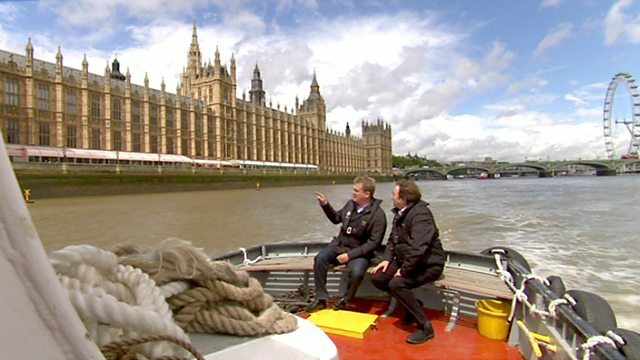 Aled Jones takes a trip on the River Thames for an alternative view of London and there's a wealth of great hymns from some of the capital's finest churches. Browse content similar to London by Boat. Check below for episodes and series from the same categories and more! I've got the wind in my hair, the waves are gently lapping. that have made London one of the greatest cities in the world. Yes, it's time to mess around on the river. I'm doing London by boat. inspired the poet William Wordsworth? the Thames is one of the most famous waterways in the world. through the heart of the city. I've actually never been on a river cruise - I'm very excited. some of London's most famous religious buildings. Every stretch of this river is a reminder of our history. and churches have been places of inspiration for centuries. London resident and Thames enthusiast. -Are you a big fan of the river? and you get a different perspective of all the landmarks. all the iconic sights, you can actually see from the river. -I've never done this before. -Also, I've never been this close to Tower Bridge. Possibly the most recognisable bridge in the whole world. and they had to get a lot of tall ships under here. and leap over the gap which he just made. is the Tower Of London. and it's perhaps one of the most famous prisons in the world. -If you see there, that is Traitors' Gate. Anne Boleyn, Catherine Howard, Sir Thomas More. and that's where we're heading now. There have been lots of London Bridges since. and sailed away, bringing the bridge down behind him. -That's where you get the nursery rhyme London Bridge Is Falling Down. -Ah, right. I never knew that. -I'll be singing that all day, now. a little bit further up. and the Queen Elizabeth Hall was added in 1967, I think. -The Southbank Arts Centre is the biggest arts centre in Britain. and now we're approaching what was Wobbly Bridge. It will always be known as the Wobbly Bridge. to the South Bank in a way that it wasn't before. And again, that idea of ancient and modern. You've got the Tate one side and St Paul's Cathedral the other. Yes, Sir Christopher Wren's masterpiece. and he was 78 by the time it was finished in 1710. Love the idea that it's right in the heart of London, as well. It is. Very much so. It's been there since 604.
and you have this magnificent dome which is 365 feet high to the top. -I could definitely feel my calves. Indeed, it's quite a scary climb up there. But also, it's a huge statement of faith, as well, isn't it? God's here in this busy hustle and bustle. It's the first thing your eye is drawn to. and material wealth - that they work together. Christianity would never have become known to the Western world. But who was St Paul? 2,000 years on, why is he still such an inspiration today? St Paul came from an area we now know as eastern Turkey. about the life of this man. Ephesus was really important for Paul. He really wanted to get there. It was the largest metropolis around the Aegean - some 250,000 people. so he wanted to get there. It was a strategic place and it was a really important part of his strategy. and it's clearly been really, really tough. It is almost a near-death experience. He also talks about having to face wild beasts in Ephesus. but it describes the opposition which he's under. South of Ephesus along the coastal route is Miletus. to the leaders of the church in Ephesus. and visit these ancient sights. Paul travelled thousands of miles, but we've seen just a tiny fraction of the distances he covered. I think he must have been a marvellous man. and we've done such distances. I don't know how he could have possibly done it by foot or on a donkey or whatever. to stand where he stood and where the early Christians stood. That's the Ionic Stoa there, where all the processions started. towards the prize, and the prize would be eternal life with Jesus. which Paul alludes to in some of his letters. as we have traced some of his steps. is a very moving account in the New Testament. It's described in Acts, chapter 20. Paul's speech is there. It's moving because he knows that it's going to be his last time with them. and then on to pastures new. and he knows that hardship is awaiting him. convinced that God has done something in Jesus which is for all people. I love this part of the Thames cos you've got the grandeur of St Pauls. But, if I'm right, isn't that St Brides? -That is indeed St Brides on Fleet Street. As you see, it's got a very distinctive shape. in the same shape as that spire. Of course, a very important wedding took place not far from here. Indeed it did. Wasn't it a most marvellous day? -That was showing London at its best. We're so good at pomp and pageantry in London. All the buildings lend themselves to this wonderful pageantry. Does the Thames have a royal connection? which was the safest and the quickest way to go. and largest inhabited castle in the world. and it's the setting for our next piece of music. -And the view every tourist comes to London to see. There it is, Big Ben. Probably the most famous clock in the world. In fact, Big Ben refers only to the great bell of the great clock. who was the commissioner of works. -who was a heavyweight champion of the time whose nickname was Big Ben. What about the House Of Commons? Magnificent. Of course, this is new, this was opened in 1852.
the oldest royal palace in London. -was the tallest building in the world when it was first built. since the 11th century, inside it, now. It's a sort of modern Tower Of Babel, you could call it. -Do you know what? I'm glad I turned up today. -I always enjoy telling these stories. destroying almost all of the original Palace Of Westminster. One of the few structures to survive was a glorious underground chapel. members of the House Of Lords and their families. -What a jewel this place is. and it's just a pool of calm and an opportunity to come in prayer. I think it's a very special space. How do you feel when you're praying here? that God is in the centre of all we're doing. Every time Parliament starts the day, it starts with prayer. Parliament and God really wouldn't go hand in hand. and there's a great deal we can do by working together. Patricia Scotland's career reads as a series of firsts. and the first female attorney general. she didn't always feel quite so part of the establishment. and my father was an equally ardent Methodist. as they thought it would be. of how they got through all of those things. Some public figures find it difficult to own up to being a Christian, if you like. and that you could be subject to attack. and look at them through the prism of the faith that you purport to have. It's never really been an issue for you, though, has it? and the credit always goes to God. I know have been through his grace. of my life and who I am. -we could have popped in to see my fellow Welshman at Lambeth Palace. There it is, the home of the Archbishop of Canterbury. Since the year 1200, I think, was when they first moved there. -in the Cranmer Tower where Cranmer compiled the prayer book. -I like to think that's where I get my writing skills from. -Not a bad place to grow up, eh? No, and it was next to the river, which is where my love for the river comes from. -It's obvious that you really do love the Thames. that I love to learn. You can never learn enough about it. I've learnt so much. I can't wait to bring my children. -I'm going to be the font of all knowledge next to you. -Thank you. I've enjoyed it, too. I always love it on the Thames. I know that you've chosen a hymn for us, as well. What is it? On a stormy day like this, it's quite relevant. It's For Those In Peril On The Sea. to be thinking for those in peril on the sea. but from having your love in our hearts. and sing forth your praise. So, here we are at our journey's end. Before we go our opposite ways, there is one question I want to ask. -By all accounts, Wordsworth was inspired by one of the bridges we've been under. "Earth has not anything to show more fair,"
was the view of Westminster Bridge. -I didn't win that bet. Thank you very much. And she uncovers some stars of the future.